Do we know where the jacking points are for this car. I just bought a 3 ton from harbor freight though I have the option for a 2.5 ton that is low profile. FF. W212 E63 M156 non-pano 18" P2 ParkT NightV (gone but will be missed). I have been waiting for similar info for a long time. That includes wanting to see some pix of the front central jacking point mentioned by another member on another thread. I'm so tempted to use the rear differential as the rear central jacking point...but have not after warned by many not to. Hopefully someone will put up some pix soon or else I'm planning to bump this thread up from time to time. Which one is the 2.5 ton low profile? Just under the car about the mirror area for the front, and about a foot from the rear wheel(forward)for the rear. You will see a notch where the factory jack will mount, but you can just use a regular jack like the one you purchased to slide in there. I used that front jacking point many times. Ill get a picture of the car lifted from there on my jack. Please feel free to PM or email me if I dont get the pic up by this evening. Definitely looking forward to the pix, lunarx. Vdubpower, I have the feeling the low profile one will be more suitable since the reverselogic jacking pad will likely fit the more flattened cup better. Of course, I would personally also prefer to use a 3 ton over a 2.5 ton. Would you need the low profile jack? Looks like you might need it if that is the lowest position for the jack. I just got that same jack (in the harbor freight link) because my regular one would not fit under the car. I needed a low profile. The jack that is on the trunk has a special head to fit into the cut out under the car. 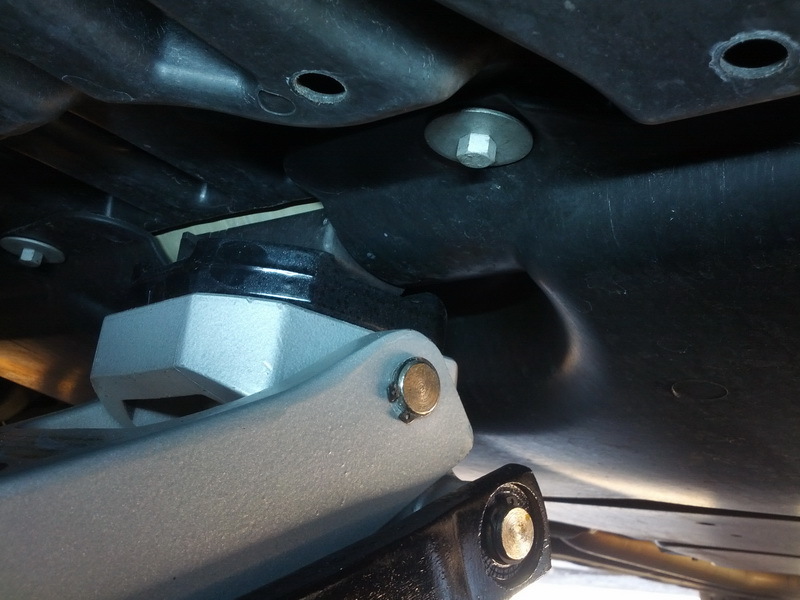 Can the harbor freight jack just push on the "jack area" under the car and not hurt anything since it doe snot fit up into the recessed area? I see someone got a small piece of wood to fit into the jack area also but does anyone know of some type of adapter to fit into the area under the car and then securely to the jack? I actually exchanged mine because it has a leak and wasn't pumping at proper pace. The same website also has excellent jack stands which I am considering. The problem being how I am supposed to put the stand in the same slot which I use to jack up the car. That is why I'm looking for a central jacking location. Avoid using the emergency jack in the trunk since individuals have reported the jack slipping off. Thus save that for emergency only when you have no other choices. Obviously, the E63 has two slots for each corner, with the outer one under the cover for emergency jack only. The one used by service dept and own jack should be the inner one. 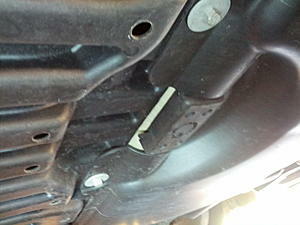 The jacking point/slot is made of some type of hard polymer plastic. Vdubpower has put up good pix of it above. Do not jack up on it directly without an adapter because you will damage it or deform it. Some idiot has jacked under my driver side rear one and I could see the deformation. I have read about the leak in the jack but the overall review is excellent. There are shops around so replacement shouldn't be a problem. I'll likely pick one up soon. I'll need it to swap winter tire this year for my other car, which fell off the scissor jack onto (luckily) the stand this January. So I plan to jack up on the rear differential of my old car this year. This is the front jacking point I have used to lift the front of the car. When the plastic covers are removed you can see that it is a very strong cross brace. With the way the covers are clearanced around it, it looks like it was designed for a jack to fit there. I'm using a Craftsman 3 Ton Aluminum Jack. Last edited by lunarx; 06-26-2012 at 03:43 AM. so thats in teh center of the car? Thanks for the photos, lunarx. I was thinking of bumping the thread a couple of days ago and then decided I will give it another couple of weeks before I do so. Hmm, I wonder if I will actually need a low profile jack jack to have that flattened cup. 1M, F550M, F550B, F40, S600, 365GTC, DBSx2, etc. Don't bother with the low-profile jack, you don't need it for this car. Also, do a quick fab of some thick rubber pads cut to size and epoxy'd onto the jack platform itself - lessens the chance of scratching stuff up, especially if you accidentally (or purposefully) decide to jack up the car from another spot. You can do it in 10 minutes with $10 of supplies. It is in the center but forward of the steering rack. That is good advice on the rubber pads. My jack has a rubber pad inside the cup which provides a soft lifting surface against the plastic pad on the cross brace. I always put wood blocks if lifting on metal parts of a car. I forgot to mention that if you remove the under tray covers you can put jack stands on the outer ends of that cross brace. Also, to access that lifting point I drive the car up on shallow ramps that I made out of 3 wood shelving boards nailed together. Race ramps would be the cooler product to use. Last edited by lunarx; 06-27-2012 at 02:21 AM. Nobody has mentioned that you should chock at least two of the wheels to help prevent the car from moving. Yes, I know we have all taken the sort cut and not done this. But after a near accident, I bought a set of big heavy rubber chocks. Regarding the photo of where to jack up the car, while it is a clear picture of the underneath of the car, but where in relationship to the outside of the car is this front point located? Fore or aft of the mirror? Where is the rear spot? For the front, the black rubber-like material in the center of the cross membrane can be seen once you remove the bottom cover in the front. You can stick the safety stands in the front jack up slots. For the rear, the location in front of the fins on the diff might be a place to jack. Just don't jack up underneath the fins. It's "maybe" because I'm not sure if it is a good idea to jack up there. I would say get two jacks and get the jack pad from the Reverse Logic website and jack up via the rear jacking slots. The problem that is left now is--where to put the safety stands? Never get underneath a vehicle without safety stands in place. Oh yes, also need the heavy rubber chokes for those wheels on the ground as mentioned. So, the rectangular boxes on the running boards are where you set the jack? How do you remove the covers without damaging the paint? Or do you mean the lift point is farther in, but at the location where the rectangles are?